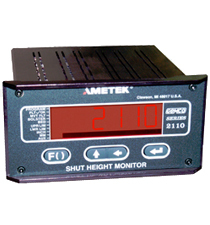 The 2110 Series Shut Height Monitor gives you a highly accurate readout as you jog the shut height motor or manually adjust the shut height mechanism. Once proper shut height is determined, the readout can be recorded for use the next time the die is used in the same press, significantly reducing setup time and the number of test parts. Position accuracy of the 2110 is +/-.001". The 2110 unit can be used with our 1986 Series Resolver Assemblies, 955D Series Brik Linear Transducer, 953D VMax Series Linear Transducer, and the 952D BlueOx Linear Transducer.